Source: Journal of Agricultural and Food Chemistry, Characterization of Anthocyanins and Proanthocyanidins in Some Cultivars of Ribes, Aronia, and Sambucus and Their Antioxidant Capacity, 2004, In collaboration with Arkansas Children's Nutrition Center and Cornell University. Aroniaberries have higher antioxidant levels than other berries (see ORAC chart on the “Science” page). Not only are they low in sugar, they also contain beneficial nutrients, such as quercetin, quinic, minerals, and vitamins. Aroniaberries contain the highest levels of anthocyanins (the pigment in the berry that gives them their dark purplish-black color) and proanthocyanidins (plant-based super-antioxidants) when compared to many of the other well-known “superfruits." You now can now enjoy the health benefits of aroniaberries all year long online at Superberries.com. Superberries features four products featuring this superfruit. Buy Aroniaberry Products including: Aronia Concentrate, Freshly Frozen Aronia Berries, Aronia Berry Gummy Chews and Superberries Aroniaberry+ Shots. Also see our aroniaberry recipes for delicious ways to use our aronia berry super fruit products. 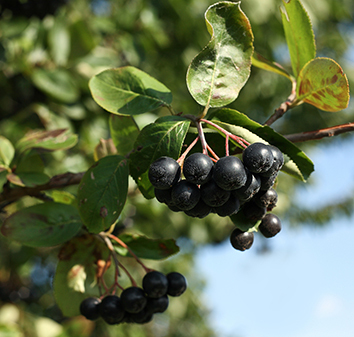 Also join our social media network for more information on aronia berry benefits.